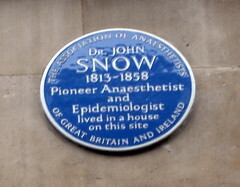 Dr. John Snow (1813-1858), a noted anaesthetist and physician, lived near the focus of the 1854 Soho Cholera epidemic, which started in August 1854 in Broad Street, as Broadwick Street was then called. 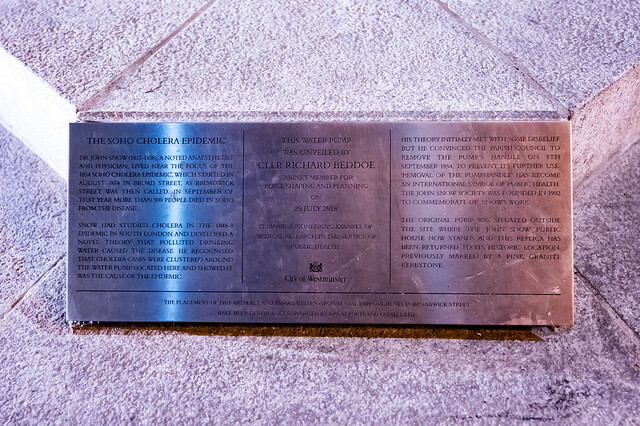 In September of that year more than 500 people died in Soho from the disease. 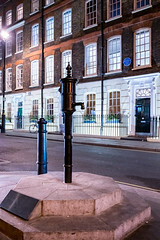 Snow had studied cholera in the 1848-9 epidemic in South London and developed a novel theory that polluted drinking water caused the disease. He recognised that cholera cases were clustered around the water pump located here and showed it was the cause of the epidemic. His theory initially met with some disbelief but he convinced the parish council to remove the pump’s handle on the 8th September 1854, to prevent its further use. Removal of the pump handle has become an international symbol of public health. 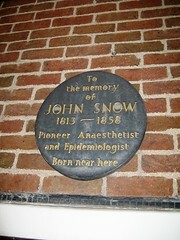 The John Snow Society was founded in 1992 to commemorate Dr Snow’s work. 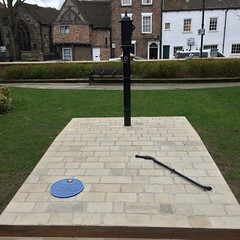 The original pump was situated outside the site where the John Snow public house now stands and this replica has been returned to its historic location, previously marked by a pink granite kerbstone.